I probably shouldn't be referring to pigs during these days of swine flu but I think you might soon see some pigs take off from Heathrow. I'm actually posting a vegetarian recipe. You didn't see that one coming, did you? I don't have anything, much ;), against vegetarians but I do prefer my food to have some kind of meat in it. However, it's not uncommon that the odd vegetarian sneaks past my quality control and I end up having to cook a non-meat alternative for the odd one out. This recipe is a variation on last Thursdays one, the Orange Marinated Chicken. I basically just replace the chicken with some nice griddled halloumi cheese. Halloumi is actually really tasty if you griddle or barbecue it. I've made salads with it before and it's really useful to have around if you throw a barbecue and there's a risk of vegetarians turning up. The couscous recipe is the same as I used in the earlier recipe and the spicyness in it contrasts really well with the halloumi. Whilst the pan is heating up, prepare the kicked-up couscous. Mix the salsa, mango chutney, orange juice and coriander well in a bowl. Once mixed, fluff up the cooked couscous using a fork and then mix in the salsa mixture. Cook the lightly oiled halloumi slices for about 2 minutes on each side, or until it starts to brown a bit. 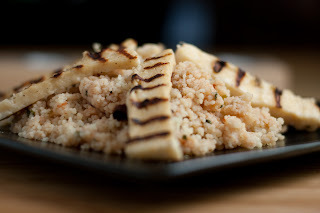 Once it's all cooked, plate the couscous and place the halloumi on top. Lovely recipe Michael... right in time for Veggie Week, which starts next week. Could you give it up for a week? The barbecue season is coming up, and halloumi is best grilled outdoors...at least in our kitchen. It is delicious, however!